Michael Doyle insists Pompey are determined to end their FA Cup curse. The Blues were handed a home tie against National League Macclesfield Town in the draw for the first round and will be big favourites to progress from the tie that will be played over the weekend of November 7-8. 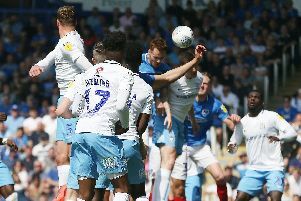 But their recent history has seen them go out at the first hurdle five years on the bounce and the Pompey skipper is eager to put that run to bed. Doyle said: ‘I didn’t know about the record. But now we’ve got to take care of business and beat Macclesfield. ‘The first thing we need to worry about is ending this terrible run that the club is on in the FA Cup. ‘Then it’s up to us to get as far as we can and hopefully take a few scalps along the way. ‘I’m just glad we didn’t get anyone in our own league. ‘You’d rather not have to play the same team three times in a season. ‘But it’s as good a draw as we could get, I suppose. ‘We’ve got a home team against non-league opposition. ‘We certainly won’t be taking anything for granted because we all know what can happen in the FA Cup. ‘We all know what this competition is all about and we’re not going to be taking it lightly. ‘Any team can beat any other team on the day. Meanwhile, Pompey are set to extend their training ground in time for next season. The club have completed a lease to acquire land alongside their current training ground in Hilsea. Pompey fans raised £270,000 through the Tifosy scheme to help put the project in place.